Our vibrating granule packaging machine: C2 was made up of feeding system, hopper, the main machine and electronic parts etc.. 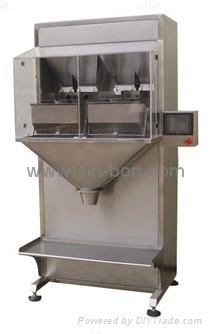 This semi-automatic granule packaging machine can finish the filling, measuring automatically. Electronic transducer control weighing feedback, no limits to the container, which is suitable for different kinds of material and different weight with high accuracy, high speed and longer life. Color PLC touch screen display, easy to operate. It can store 10 different product parameters. And the composite of stainless steel and the organic glass, makes it very easy to clean without tools. It adopts the vibrating feeding system; and electronic transducer control the weighing feedback to make sure the high accuracy. In case of heavy dust, we will arrange a industrial cleaner. The transmission parts of the whole machine were made of SS304, the design is practical and beautiful, and the key components adopt the famous brand at home and abroad. High speed, high accuracy. Dosing and weighing of small grain, powder material of daily food and condiment such as while sugar, salt, seed, rice, sodium glutamate, fodder, milk powder, coffee and sesame etc.